Red wines, particularly cabernet sauvignon, petite sirah, and pinot noir, have been directly linked by scientists to health benefits, such as inhibiting cancer, due to their high levels of antioxidants. 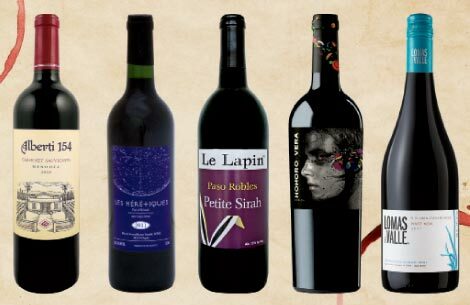 Consider the boost a bonus effect of this intriguing selection of wines tailored to a modest budget. Santé! Aged in oak for 10 months, this cabernet sauvignon comes from granite-covered Argentinian soils which release heat at night, ripening the grapes. Bold, with a scent of old books and ripe fruit, it’s great with grilled sardines or mackerel. The French have long been advocates of pleasures in a glass. This wine sings of sunshine and adventure, two contributors to raised spirits. Serve a glass with a hardy vegetable soup or toss it in your bag with saucisson and a baguette for a winter picnic. This vineyard’s rugged, rocky, and calcareous terrain produces some of California’s finest wines. The effects of rapid temperature changes here result in a hardy grape. This nonvintage blend holds a deep, velvety feel, and is a match for chocolate or a raspberry tart. This Spanish merlot is exceptionally rich and pleasing to the palate. High in melatonin, merlot is a welcome beverage to slow a racing mind. If cigar-smoking is your only vice, this is the wine to accompany that particular guilty pleasure. From the Casablanca Valley in Chile, this pinot noir has a delightful mineral quality and a youthfully sophisticated taste. A hint of cilantro makes it an excellent pairing for Mexican fare.